The Mendacious Mainstream Myth Makers transformed 1905 into an Annus Mirabilis with the publication of North American Indian Fairy Tales. This pernicious tome presented to an “advanced civilisation” the collective cultural heritage of the “Indians of North America” as a series of “fantastic” Fairy Tales from a “primitive” people. It might have been expected that the Indians of North America would have many Folklore tales to tell, and in this volume I have endeavoured to present such of them as seemed to me to best illustrate the primitive character and beliefs of the people. The belief, and the language in which it is clothed, are often very beautiful. Fantastic imagination, magnanimity, moral sentiment, tender feeling, and humour are discovered in a degree which may astonish many who have been apt to imagine that advanced civilisation has much to do with the possession of such qualities. I know of nothing that throws so much light upon Indian character as their Folk-tales. Unsurprisingly, Wikipedia uses a Fairy Tale from this pernicious publication to popularise their “flood myth motif” whilst simultaneously promoting their Ice Age myth motif which has “all the infirmity of the science of the Middle Ages” [Henry Howarth]. The flood myth motif is found among many cultures as seen in the Mesopotamian flood stories, Deucalion in Greek mythology, the Genesis flood narrative, the Hindu texts from India, Bergelmir in Norse Mythology, and in the lore of the K’iche’ and Maya peoples in Mesoamerica, the Lac Courte Oreilles Ojibwa tribe of Native Americans in North America, the Muisca, and Cañari Confederation, in South America. Floods in the wake of the last glacial period may have inspired myths that survive to this day. It has been postulated that the deluge myth in North America may be based on a sudden rise in sea levels caused by the rapid draining of prehistoric Lake Agassiz at the end of the last Ice Age, about 8,400 years ago. I hold that the Glacial theory, as ordinarily taught, is based not upon induction, but upon hypotheses, some of which are incapable of verification, while others can be shown to be false, and it has all the infirmity of the science of the Middle Ages. This is why I have called it a Glacial Nightmare. Holding it to be false, I hold further that no theory of modern times has had a more disastrously mischievous effect upon the progress of Natural Science. Thankfully, there are more credible sources than North American Indian Fairy Tales and James Mooney confirms The Deluge is a widespread narrative in the Americas. It is found also along the Northwest coast, was known about Albemarle sound, and, as has been said, was probably common to all the tribes. The Cephas Washburn version of The Deluge narrative told by the Cherokees of the Arkansas echoes the Noah’s Ark storyline and further supports the argument that there was a connection between the New World and the Ten Lost Tribes of Israel. God told this family that He would bring a great flood of water, and drown the whole world ; and directed this family to build a very great raft, which covered many acres, and to make a house on the raft for the family, and a storehouse for food; and then he told a pair of all kinds of animals, that could not live in the water, to go on to the raft with the good family, and so they were saved alive when the flood came. This Cherokee Deluge narrative continues in truly Biblical fashion with submerged lands rising up and water being “rolled to those parts of the earth where men and beasts were living”. It was asked, where did the water come from sufficient to cover all the earth ? He answered, God could easily create water at any time to drown the world, but our old men have told us that it rained very hard for a long time ; that before the flood, the island that we now live on, (meaning the entire western continent,) was down very deep in the great salt lake; and God caused it to rise, and the water rolled to those parts of the earth where men and beasts were living ; and so all that part of the world was overflowed with water to a great depth. When asked where all this water went to when the earth again became dry, he said, God had made great hollows or caverns in the earth, and the water had retired to these caverns, or, as He did no longer need the water, He might have made it into something else. Many of the red people believe that rocks and minerals were made out of the waters of the flood. For the Biblical “springs of the deep” and “windows of heaven” the Etch A Sketch Skool of Geology needs something like catastrophic sea floor spreading which invokes earthquakes [including upheavals and subsidence] and vast volumes of water [from the inland seas and lakes] encountering vast volcanic eruptions [in the oceanic basins and rifting seascapes]. James Mooney references this narrative in Myths of the Cherokee and it’s possible The Deluge caused in the Cherokee to migrate southwards. Washburn’s informant, however, accounted for the phenomenon by an upheaval and tilting of the earth, so that the waters for a time overflowed the inhabited parts (Reminiscences, pp. 196-197). The Cherokee are a Native American people, originally indigenous to the Southeastern United States (principally Georgia, Tennessee, North Carolina, and South Carolina). Currently there are three federally recognized Cherokee tribes: the Eastern Band of Cherokee Indians in North Carolina, the Cherokee Nation of Oklahoma, and the United Keetoowah Band of Cherokee Indians, also in Oklahoma. The Cherokee language is part of the Iroquoian language group. In the nineteenth century, historians and ethnographers recorded an oral tradition that told of the tribe having migrated south in ancient times from the Great Lakes region, where other Iroquoian-speaking peoples lived. James Mooney’s description of The Deluge also includes a reference to a “star with fiery tail” that “falls from heaven”. In a variant related by Hagar (MS Stellar Legends of the Cherokee) a star with fiery tail falls from heaven and becomes a man with long hair, who warns the people of the coming deluge. At some ancient period, so remote that even legend does not note it, the earth most probably came so near the sphere of influence of some other planet, that it momentarily swung out of its solar trend, causing a cataclysm that instantly transformed the zones so suddenly that the giant mammoths were frozen as they stood, to be later incased in great masses of ice and preserved so well that as it melted away from their bodies the flesh was so fresh that it was eaten by dogs and other animals. The immense glaciers were left in the temperate and possibly the torrid zones. As to whether any land was raised at that time there is a question, but there is very little doubt that much of the land connecting northern Europe and America was submerged, leaving only Greenland, Iceland and a few other elevated portions above sea level. The flora and fossil remains indicate a previous continuity and the charts of the ocean bed show a well defined plateau at only a comparatively shallow depth extending from Labrador to Norway. These seismic and climatic convulsions most probably very nearly destroyed the cave dwellers of what had been the united continent of Euromerica but on account of their peculiar hardiness a few survived to repopulate the riven continent. Mooney also noted the petroglyphs at Track Rock gap in Georgia may depict The Deluge. Haywood (Nat. and Aborig. Hist. Tenn., p. 161) mentions the Cherokee deluge myth and conjectures that the petroglyphs at Track Rock gap in Georgia may have some reference to it. Track Rock is located in the Track Rock Gap Archaeological Area (9Un367) in the Brasstown Ranger District of the Chattahoochee National Forest in Georgia. This 52-acre (210,000 m2) area contains preserved petroglyphs of ancient Native American origin that resemble animal and bird tracks, crosses, circles and human footprints. 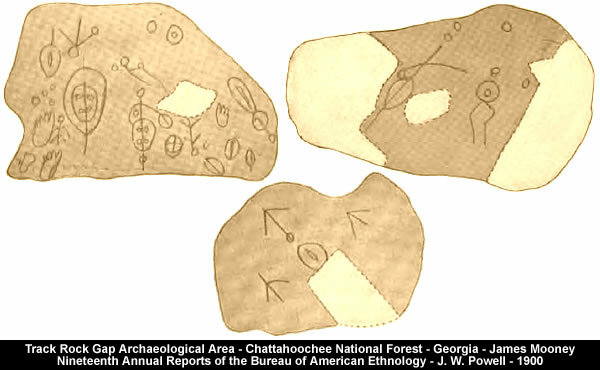 Following this train of thought Gary Daniels suggests the petroglyphs in Forsyth County [Georgia] may represent [amongst other things] Draco, Pleiades and a comet. North American Indian Fairy Tales and Albert Einstein were launched in the same year. Therefore, when Settled Science proclaims 1905 to be another “year of miracles” it’s worth taking a closer look. The year 1905 has very much been linked to the term annus mirabilis, as Albert Einstein made important discoveries concerning the photoelectric effect, Brownian motion and the special theory of relativity as well as the famous E = mc2. His articles, collectively known as his Annus Mirabilis papers, were published in Annalen der Physik in 1905. The Annus mirabilis papers (from Latin annus mīrābilis, “extraordinary year”) are the papers of Albert Einstein published in the Annalen der Physik scientific journal in 1905. These four articles contributed substantially to the foundation of modern physics and changed views on space, time, mass, and energy. Gallery | This entry was posted in Books, Catastrophism, Earth, Electric Universe, Geology, Glaciology, History, Inflating Earth, Science, Solar System. Bookmark the permalink. Have you ever heard of the Younger Dryas event? its what is responsible for this event and theres plenty information on it. But when did the “Younger Dryas” event take place?